If you are avoiding Chipotle lately, you aren't the only one. Customers -- and investors -- haven't fully returned. Sales at existing Chipotle restaurants are down 22% from a year ago. 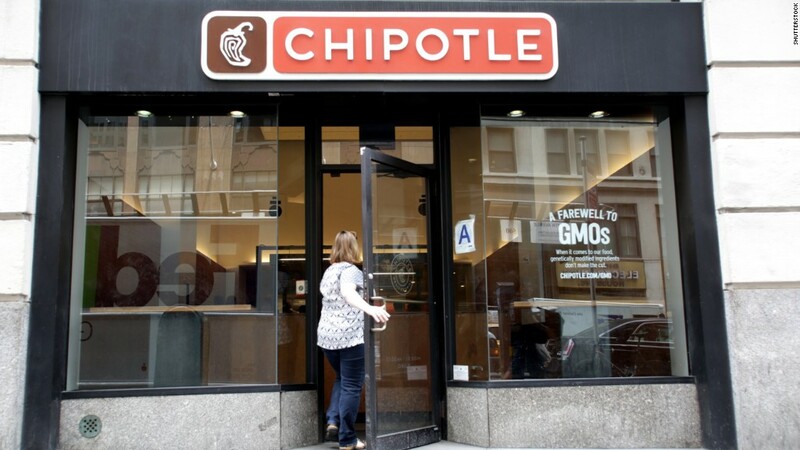 America learned of a nationwide E. coli outbreak at Chipotle (CMG) almost exactly a year ago. It wasn't a Halloween scare, it was real. And it was happening at the beloved chain that operates under the slogan "Food with Integrity." Overnight, the long lunch lines at Chipotle that used to spill out the door evaporated. Will some customers never return? Wall Street is starting to wonder. The stock fell about 2% after the latest earnings came out Tuesday afternoon that didn't show much improvement from the terrible start to 2016. Founder and CEO Steve Ells tried to put a positive spin on it: "Our research demonstrates that people are feeling better about our brand," he said. Chipotle is trying to tell the world: Stick with us! It's planning a wide TV ad campaign. But its reputation is damaged, according to YouGov BrandIndex, a firm that tracks a brand's reputation. Before all the bad food outbreaks, Chipotle scored a very healthy 25 on YouGov's quality ranking (the scale goes from -100 to +100). Then it plunged to -5 by February. 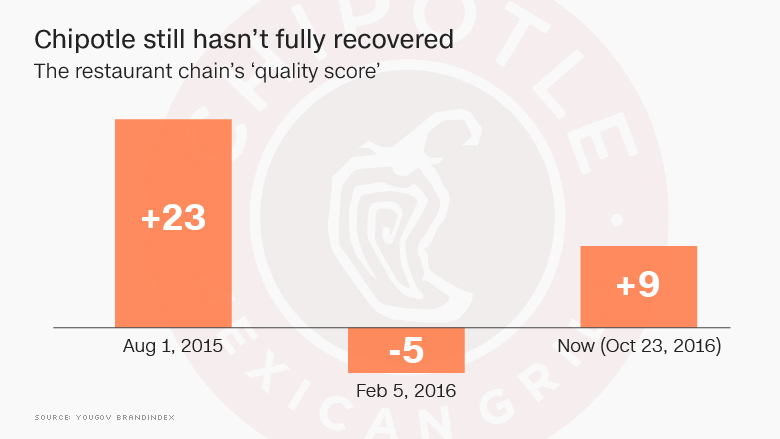 Chipotle's quality score has recovered to 9 recently, but that's still far from where it was. Translation: Customers don't see Chipotle as the golden brand it was before the E. coli outbreak. Investors don't either. Chipotle had been an investors' darling for years. Last October, Chipotle stock was changing hands at $750 apiece. After the latest earnings, it's below $400 -- down over 45%. "The road to recovery is long," says Mark Kalinowski, a restaurant industry analyst at Nomura Holdings. "Food safety issues really get at what the brand is supposed to be all about." To entice customers, Chipotle introduced coupons, burrito giveaways and a loyalty program called "Chiptopia." All these freebies have hurt the bottom line. Chipotle argues that it's most loyal fans are back. A quick scan of social media shows plenty of Millennial love for the chain. A couple even did an entire "baby photo shoot" holding a Chipotle burrito instead of a little one. But the latest earnings make it clear: The lines aren't quite as long, and the 23-year-old brand has lost some sheen. "Success to us is getting all the sales back," said John Hartung, Chipotle's chief financial officer, in July. "How long it will take, we just don't know,"
The Centers for Disease Control and Prevention never determined the exact cause of Chipotle's E. coli outbreak that made at least 55 customers sick across 11 states, but it suggested that it originated during the food prep process. Chipotle's problems didn't end there. In December, there was an outbreak of norovirus at a Chipotle restaurant near Boston College, which sickened 140 students, including some players on the school's popular basketball team. CEO and founder Steve Ells apologized to the nation two days later, saying "I'm sorry for the people that got sick. They're having a tough time. I feel terrible about that." He vowed the company would soon be "the safest place to eat." Can Chipotle win back enough customers? By April, food safety issues had taken a big bite out of Chipotle's bottom line. Chipotle reported its first ever quarterly loss in April after the company doubled down efforts to reform its food safety protocols and start a new round of advertising to lure back weary customers. This time, getting people in the door came at a cost. CEO Ells has dubbed this a "year of reinvestment." The company has taken extensive measures to make its food and stores safer. 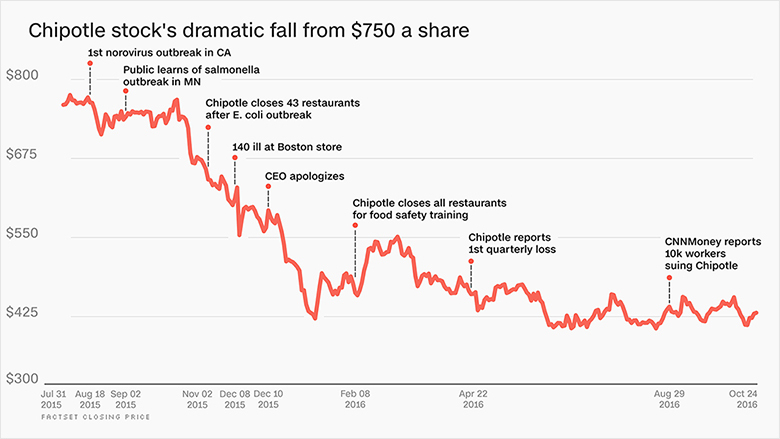 Still, Chipotle's awful year was made worse in other ways. In July, Chipotle's chief creative and development officer, Mark Crumpacker, was arrested on seven counts of cocaine possession. He was suspended and reinstated to his position in September. Chipotle faces another major expense: lawsuits. By August, nearly 10,000 workers sued Chipotle in a class action lawsuit accusing the company of "wage theft" where workers are forced to clock out but continue clean up and prep for the next shift without getting paid. In September, Chipotle reached a settlement with 100 customers who got sick from last year's food illnesses and had to pay a former worker $8 million after she won a sexual harassment case against the chain. Even one year after Chipotle fell dramatically off its pedestal, the stock still too expensive for most investors. The stock trades at 61 times forward earnings, far above the 18 times forward earnings of the S&P 500. It used to be hard to find analysts who didn't give Chipotle stock a "buy" rating. Today, the majority of experts have a "sell" or "hold" rating, according to FactSet. "Usually you don't want relatively expensive stocks to be risky stocks," says Kalinowski, the analyst. "I would say this is a risky stock at this point."